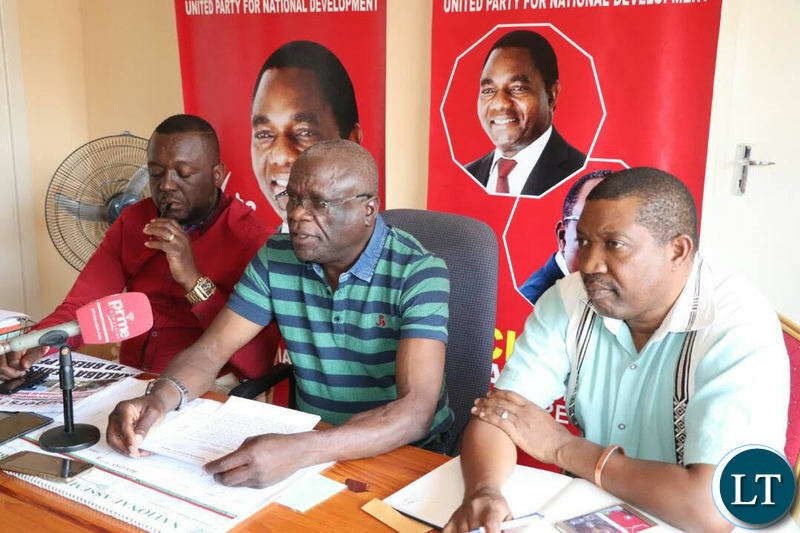 UPND Secretary General Stephen Katuka addressing a media briefing today flanked by Mazabuka Central MP Garry Nkombo and Deputy National Secretary Patrick Mucheleka. United Party for National Development Secretary General Stephen Katuka says the UPND is a sober, civilised and disciplined political party but with a capacity to defend itself when provoked. Speaking in the aftermath of the violence that rocked the Mkomba ward and Sesheke constituency elections in which a horde of PF cadres led by known elements attacked the UPND campaign posts yesterday, Mr.Katuka said the party has the capacity to defend itself against the PF which is hiding behind the strength of some bad elements in the Zambia police service. He said it is shame that the Electoral Commission of Zambia has failed to play its constitutional role as an election referee but is instead being seen to side with the ruling party thus creating a source of conflict and mistrust among political players. “We do not believe in violence like the PF.But this manner of uncivilised behavior by the PF leaves us with no choice but to demand that our members defend themselves against PF and ‘police’ aggression on them because we are equal to the task.What defensive mechanisms the members will employ is dependant on themselves.This is not right and the ECZ is watching instead of playing its role as an election referee.This we shall not tolerate, ” he said. ” We had a meeting with the ECZ on 7th January 2019 with President Hichilema and other senior party officials at which we told the commission that it is failing to manage elections in the country.Yesterday’s violent attacks in Lundazi and Sesheke have vindicated us.It is the role of the ECZ to manage the elections by detailing the police and telling them what is expected of them.Teargas is unnecessarily unnecessary in an election. Mr. Katuka says elections should not be a source of conflicts but a joy for choosing representatives, “he added. He further said the PF were the major beneficiaries of a defective Public order Act and misrule hence its snubbing of the church led national dialogue process which would iron out the defects, adding that the PF was facing an imminent election defeat thus resorting to violence, intimidation and other acts of terror. Mr. Katuka also adviced the Inspector General of Police, Kakoma Kanganja to tame his officer’s insatiable appetite for teargas describing the conduct as primitive and aimed at intimidating voters and campaigners. “We have since written to the Electoral Commission of Zambia and attached video evidence of the PF violence in Lundazi.We have since demanded that the commission disciplines the PF as the sponsor of violence and show cause why its candidate should not be disqualified in line with the Electoral Act.Any failure by the commission to take remedial steps against the PF will leave us with no choice but believe that they are in collusion with the PF, ” the Secretary General said. 8 UPND members were yesterday left with minor injuries after their camp was invaded by known PF members led by area independent lawmaker Lawrence Nyirenda and District PF IPS Portipher Mbewe. The attack was however repelled by an irate mob of villagers who outnumbered the assailants while police fired teargas canisters in Sesheke in a show of defiance by residents which lasted more than 2 hours. The police are acting like a referee who holds the hands of one opponent and leaves the other to freely throw punches . Invest in bodycams and document all the videos for the future. They won’t be in power forever. Ignore him. He is a quack. He is not worth to be the SG for UPND. These guys have really run out ideas. We have not opposition party in Zambia. Fellow citizens, let’s not take the peace we have for granted. We must all condemn any acts if violence that undermine our country’s peace. After Sata (MHSRIP), the party has become a home grown terrorist organisation, these strategies are the primary cause of voter apathy. Only FF supporters will be free to go out and vote on the election day knowing they are protected. After winning they will be cerebrating that we are a popular party. It is for this reason that PF will do everything possible to frustrate the Church chaired dialogue process using ZCID board. International Development partners should find ways to sanction our leaders like freezing their assets or help track all their illegal deals and publish the findings through international medias. You will never grow folks. Too childish, low grade leaders. Ati dialogue. Everything starts with your hearts. Wasted years growing up. Look at at the 3 marketeers, so petty. The guy is just looking for an excuse to start violence. I’m not and will never be impressed by his antics. One thing politicians don’t realise before opening their mouth is that they have families, villages and they are part of the society they want to destroy. One will wonder what is UPND? Is it a tribe, a reble group or a political party? And if it is a political party, why is it always on the center of controversy? Why thinking you can be attacked as if you are a reble group? And if you are not a tribe or race, how can someone be positive that they are attacking a UPND carder not their fellow? I wish there could be someone who can make me understand what UPND realy is ,because there has been powerful political parties in zambia which have never been attacked by their fellow opposition unlike these cowards who always fear their own shadows. Useless quacks. Look at them. So utterly pathetic. This is now becoming a usual UPND slogan when they are about to lose an election. Someone tell me they have never heard this before. The best way to defend yourself when attacked is to run. It’s better to be a coward than dead. Saying you have the capability to defend yourself even when you can is a always a bad call. Why this violence kanshi, since PF came on the scene violence erupted in Zambian politics, long ago this was not the case, so people know very well which party is violent. Political violence has always been there in Zambia and has become worse with advent of a well known loser. This Katuka chap is the major problem as far as violence in UPND is concerned. He has nothing to say to quell supporters on either side so that peaceful campaigning is encouraged. Like GBM, the two are bad news for Zambian politics. So it’s ok for Upnd to damage campaign materials of their opponents? Look ’em up violent goons. Extremely ill-cultured and unprincipled left part of the brain thinkers. Dangerous c.r.a.z.y thick bald heads. The language of trib.als is a language of violence. They don’t know anything else, worse they dont know where they are going or coming from. Losing has taken a heavy toll on them and losing is their destiny. Pathetic chaps, especially this wit.ch like thing Katuka, insulter. And to the contrary their boss T.H. pretends to talk peace, but he avctually looks lost in all his interviews. UPND in every election they talk about amargadon, defending themselves,mapatizya formula,Pangas and the like, but when are they going to talk about PEACE? This party is set for everlasting doom. How do you defend yourself on mere provocation? Mr SG just say that your party is capable of fermenting violence as has been witnessed in the past. Your cry baby President does not condemn violence and is the author of it. You are just a shameless violent party that is all. You should be ashamed that you are a political part known for violence and arson. The only party that has neither a solution to violence nor seeks a solution. Just trib.al muddles. Look at T.H. supposedly their “leader”, ati “when we form government I will increase the price of maize to farmers and reduce the price of mealie meal to consumers, blah blah today this tomorrow completely 180 degrees u-turn. And then look at trib.al Jay Gay, instead of pointing out the weaknesses and errors of President Lungu politely in order to build, he and they look at it from the trib.al view point. No mention of the glaring weaknesses and fakeness and grave danger posed by their T.H. and yet they project him as their proposed alternative for reasons that can only be trib.al according to the objectives set out by Ackson Sejani in 2006. Jay Gay, just abandon the trib.al crusade mwana, it is taking you and yours deeper into the abyss. The negative “Lazy Lungu” trib.al mantra will not take you anywhere, Jay Gay. Learn to build by pointing out the weaknesses and where you want him to improve. Like me, I have said that the incessant issuing of directives should be reduced and done judiciously otherwise the impression created is that the President is the only repository of knowledge in Zambia, some kind of know it all attitude. Just an example.